Learn how tankless water heaters can provide a more effective and efficient solution for your home. Water heaters traditionally consist of a large tank that heat and store water, even when the system isn't in use. Tank-type water heaters consume energy on an ongoing basis to keep water hot in tank. When the stored water cools due to standby heat loss, a thermostat in the tank triggers the reheating process. This is a naturally inefficient process that wastes energy and money. For many homeowners, the solution to this problem is a tankless water heater. 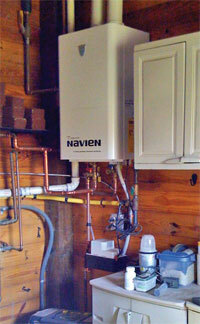 Tankless water heaters are far more efficient options because they only heat water as it is being used. Dr. Energy Saver specializes in installing tankless water heater systems, and we can help you improve your home's efficiency. Call your local dealer today to get an estimate on tankless water heater installation! Tankless water heaters have gained popularity in recent years among homeowners who are interested in saving energy and cutting utility costs. Tankless water heaters operate by turning on as a hot water tap or appliance is activated, heating the water through a heat exchanger as its moved to the faucet, dishwasher, washing machine, or shower head. When the hot water tap is turned off, the water heater turns off. This process means that the water heater is only consuming fuel (usually natural gas or propane) when the hot water is actually being used. This is a stark contrast to tank-type water heaters, which store a large volume of water that is continually heated to a certain temperature, regardless of whether or not the system is in use. By switching to a tankless water heater, you will reduce fuel consumption and save money on your bills. However, it should be noted that this type of water heater isn't for everyone. A family that needs frequently needs a large volume hot water (running the shower, dishwasher, and washing machine at the same time, for example), may find that a tankless water heater can't supply enough hot water to meet their needs. Your Dr. Energy Saver dealer can evaluate your home and your water heating system to help you determine what the best options are for your needs. If a tankless water heater isn't the right fit, you can still save money through upgrades such as tank and pipe insulation to limit standby heat loss. Water heating can account for nearly 20% of a household's annual energy budget, which why it's important to be sure you have the best option available. Dr. Energy Saver can provide you with a quality tankless water heater installation that ensures you get the performance you need while reducing your utility bills. Call us today to get started with an evaluation and estimate!